#BISDbot | Birdville ISD Blog! The Board of Trustees met in regular session on Thursday, March 28. The following link will provide you a summary of actions taken at their meeting. The Board of Trustees met in regular session on Thursday, February 28. The following link will provide you a summary of actions taken at their meeting. January is School Board Recognition Month, and Birdville ISD will join the Texas Association of School Boards and other districts across the state to honor the countless contributions of these locally elected advocates for Texas schoolchildren and public schools. 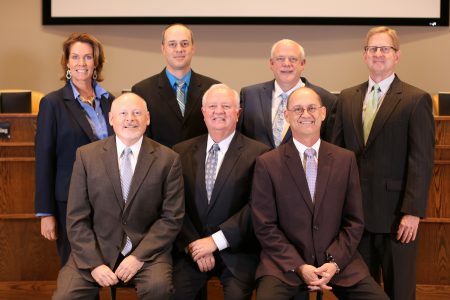 School board members tackle a difficult job and shoulder enormous responsibilities. These men and women are elected to establish the policies that provide the framework for our public schools. They provide vision and leadership in their roles as advocates, and they will continue to stand up for public education and guard against anything that takes away from our children or undermines our public schools. Richard Davis, Board president, was elected to the BISD Board of Trustees in 2006. He is a 1974 graduate of Richland High School. Davis is the director of sales for Lift Aids, Inc.
Ralph Kunkel, Board vice president, was elected to the BISD Board of Trustees in 2002. Kunkel is a 1978 graduate of Haltom High School. He has worked as an employee benefits consultant for more than 30 years. Jack McCarty, Board secretary, was elected to the BISD Board of Trustees in 2011. He attended Birdville schools and graduated from Richland High School in 1980. McCarty is a licensed CPA in the state of Texas and the chief operating officer for United Healthcare Student Resources. Joe Tolbert, Board president, was elected to the BISD Board of Trustees in 2006. He is an attorney with Brackett & Ellis, P.C. Kelvin Dilks was elected to the BISD Board of Trustees in May 2017. Dilks is a retired BISD teacher. Whitney Harding was elected to the BISD Board of Trustees in May 2017. She is a private investigator with Wallace Investigations. Kris Drees joined the Board in 2018. He is senior pastor at Haltom Road Baptist Church. “As parents or educators of current or former BISD students, these seven volunteers know the importance of a quality education. That is why they freely give of themselves to the Birdville family. Please take a moment and thank our school board members for caring about our children and giving so much to the Birdville family,” said Dr. Darrell Brown, BISD superintendent. The Board of Trustees met in regular session on Thursday, January 24. The following link will provide you a summary of actions taken at their meeting. The Board of Trustees met in regular session on Thursday, December 13. The following link will provide you a summary of actions taken at their meeting. The Board of Trustees met in regular session on Thursday, November 15. The following link will provide you a summary of actions taken at their meeting.